"Dedicated to the pursuit of justice, the prevention of crime, and the preservation of our future." The Victim/Witness Assistance Program was created by the district attorney to work with victims and witnesses to crime. 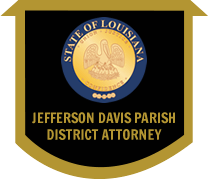 the purpose of the Victim/Witness Program is to ensure that victims and witnesses of crime are treated with dignity, respect, courtesy and sensitivity, and that the rights as provided by Louisiana Law are honored and protected. In 1996 the Louisiana Legislature enacted Revised Statue 16:17, which created the position of "Victim Assistance Coordinator" within the office of the District Attorney. Full funding for the position was approved in 1997, and the law took effect on August 15, 1997. The Victim Assistance Coordinator (VAC) is an advocate for the rights of the victim, both in the courtroom and in the office. The victim is kept informed about the progress of the case, and any questions the victim may have about the process are answered. The VAC is also a liaison between the prosecutor and the victim. In this role, the coordinator not only keeps the victim aware of upcoming court proceedings, but explains the proceedings to the victim. The coordinator is a liaison between the victim and the penal system. In addition to these services, the Victim/Witness Assistant Coordinator can assist victims of crime in completing a victim impact statement to determine financial losses suffered by the victim. the coordinator also provides referrals to community-based programs for financial and emotional support such as the Crime Victims Reparation Program and counseling agencies. The coordinator provides notification to victims and witnesses of court proceedings, accompanies victims and witnesses to court, provides courtroom orientation, when needed, coordinates meetings between the victim and witness with the prosecuting attorney on their case and provides a host of other services.